Why is my Deceased Data Record count different from my Export File count? Some times, multiple consumers provide information about a deceased individual. Unfortunately, this information is not always the same. One individual may give a different age or different deceased date. 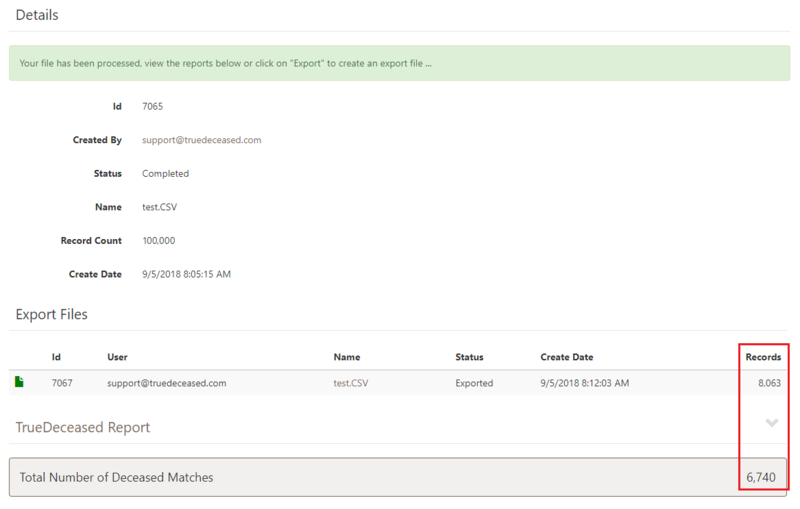 TrueDeceased makes sure you receive ALL of this information in your export. Records can match on multiple fields: Donor name (including nick names), current or historical addresses, emails, and/or phone numbers. This means that one record could have multiple matches. However, in the deceased record count, we only provide a count of unique IDs. A deceased record could have matched to multiple deceased records. A deceased record could have matched to more than one address. Head to our Frequently Asked Questions page to explore more!